Property Size 3,350 sq. ft. Welcome to Boomerang Beach House! 200 STEPS TO PRIVATE BEACH ACCESS! The Boomerang Beach House, with THE BACKYARD!! A "best of area" backyard with 18 lighted Palm trees for that upscale resort living you thought you could only dream of! Featuring a large 30x15 pool and detached hot tub, 14x14 tiki hut with seating, a pool table, a ping-pong table, baggo pit, and BBQ area, as well as resort quality dining table and chaise lounges. 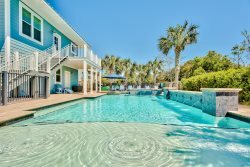 You get to decide whether you want to spend the day at our expansive award winning private neighborhood beach, or enjoy the exclusive community of Frangista Beach at arguably one of the most unique back yards in all of the Destin area - or do both!! Situated with just a few steps between you and the sugary white sand beaches that Destin is famous for on a private neighborhood exclusive beach. The house itself is nearly 4200 sf with another 1000 sf spread out over 5 private balconies and porches! You will enjoy the nearby shops of the Silver Sands Premium Outlets and the walk-able beachfront restaurants near this exclusive community along Scenic Highway 98, which is also connected to the over 5 mile long paved walkway should you choose to enjoy early morning walks with your sweetheart! Flat screen TVs in every bedroom and both living areas. Xbox360 for the kids, an extensive video collection as well as games and books for all ages. Each floor has its own new HVAC unit for comfort throughout. Scraped wood floors in the 3 king suites and on the stairs. Amenities galore, including beach toys and chairs, beach umbrellas and towels, a beach cart - we want you coming back! 1st Queen bunk room, 2nd Queen bunk room, Full bathroom, Hall bunk room, Laundry Room, 2 car garage filled with beach equipment for your enjoyment as well as a 2nd refrigerator for your use. Let the kids or teens enjoy their own private haven! Each bunk room offers queen over queen built-in permanent bunk beds. 32" flat screen TV's to keep them entertained even during down time. Separate bathroom with outside door is convenient for the nice over-sized pool compared to the typical Destin pool. Twin over twin bunks in the hallway bring the sleep total up to a comfortable and impressive 10 on the 1st floor. Main living room, Kitchen, Dining area, Wet Bar, King bedroom, Full bathroom, Half bath. Enjoy watching a DVD on the 60" flat screen from the comfortable sleeper/sofa or matching love seat. Or just enjoy curling up and reading a good novel in the luxurious chair and ottoman while the kids and mom or dad are off fighting the waves. The living room flows into the dining area where you will enjoy a fabulous large dining table for 6 with water hyacinth chairs and 4 matching bar stools along the counter for plenty of seating. The attached wet bar area offers plenty of ice with the separate ice maker. 3 sets of French doors lead to the very spacious balcony over looking the backyard retreat. Enjoy the shaded overhang while still seeing all the action unfold beneath you. The kitchen is a gourmet's dream! Stainless everything and granite counter tops with plenty of storage. The 1st of 3 King "retreat" bedrooms is located on the second floor. This Master bedroom features a pillow top king bed. Step through the French doors and enjoy the oversized private balcony where you can sit and wile your time away. Or pop a DVD in and wind down a perfect day enjoying the 40" flat screen. 2nd Living room, 2nd Master King bedroom, 3rd Master King bedroom (each attached with bathroom with tile showers and separate jetted tubs). This living room is great for the kids to enjoy watching a DVD away from the parents or playing on the supplied XBox (with a few games or feel free to bring your own - just make sure they don't spend all their time indoors on their vacation!). The couch pulls out to a queen bed for those larger groups. French doors lead to the outside balcony overlooking the pool and backyard retreat, and glimpses of what you came to Destin for - our Beautiful Emerald Ocean! Off the living room is the 2nd King pillow top Master with generous oversized palatial bathroom. Lose yourself in this large room with plenty space. The large closet also has all the toddler items you might need such as a porta-crib, baby monitor, etc... Step outside on the balcony and enjoy any activities going on in the back yard (such as the vacation ping-pong tournament or pool championship). Another 40" flat screen and DVD allows for that perfect wind down. The 3rd King Master retreat located on the front side of the house, enjoys its own large private balcony. This generous sized room features another pillow top king bed as well as a chaise (pull-out) that can be used as a twin as well. The large bathroom keeps the luxurious feel going with the jetted tub or walk-in tile shower. The back yard is truly special and a wonderful way to spend the time when you are not at the beach. The large pool is the perfect fresh water compliment to our wonderful Emerald Gulf. Pool table - check, ping-pong table - check, hot tub - check, custom baggo set - check. Activities for everyone and we also feature a gas grill and an outdoor shower to clean up with before going back inside. The shaded "tiki-hut" offers a nice area to enjoy a snack or meal. With plenty of resort quality chaise lounge chairs as well as seating and dining, be as active as you want or just soak up the sun. Our neighborhood of Frangista Beach consists of mostly large homes where families come to vacation. It spans the equivalent of approximately 4 blocks. The neighborhood has a 400 yard private beach which you must have a code to access. This home is within walking distance of a coffee shop, deli, Dairy Queen, a beach gear shop and local favorite beach front seafood restaurants, Pompano Joe's and Whales Tale. Frangista Beach is also home to Emerald Coast Wine Cellars where you can sample and purchase wines made exclusively in Florida. A large Winn-Dixie grocery store is 1.5 miles to the east and beside it you will find the largest designer outlet mall in the Southeast, Silver Sands Premium Outlet. Frangista Beach has a rich history that began when a family from Greece built a small motel and, subsequently, a little white Synagogue (which still stands to this day). Many brides are married on the Frangista Beach and use the picturesque chapel for photographs. After visiting this neighborhood, you will understand why so many families choose to return year after year. *This home rents ONLY Saturday to Saturday during Spring Break and Summer Months. Please call if you have any questions. *Weddings/Events – If held on private beach an additional $500.00 HOA fee is required for permit. Please note tents and canopies are not allowed on private beach due to HOA regulations. All bathrooms come equipped with a hair dryer and luxurious towels. Overall a great house and location. The backyard is perfect for families. Lots of space in the house as well. The owners are great to work with and want you to have a great vacation. We had the time of our lives. We never even needed to leave the property- everything was right there for us. The pool, hot tube, ping pong and pool tables kept 10 children and 9 adults happy and busy. Clean, spacious, exactly as described! We loved everything about the house. Well stocked kitchen, comfy beds, nice towels and plenty of them. AmaZing backyard with a warm pool. Short walk to beach, DQ, and gift shops. Thanks so much from our family of 14. Immediate responses and very professional, friendly and accommodating! Amazing home with everything you need for a relaxing and totally luxurious and effortless family or group vacation. It was a great place, Back yard! Great vacation! The Boomerang team and the Dukes have completely spoiled us. These properties have become our gold standard. When we rent homes in other places, our expectations are compared to the Boomerang properties and team which are far superior. The Boomerang Beach House is gorgeous and the backyard is quite the entertainment center! We had a wonderful time. Your housekeeping crew does an excellent job. The beds are comfy. The kitchen is well equipped ...plenty of dishes, glasses, cookware, and even a Keurig. All of the TLC and creativity you have put into your beach rentals adds so much to make a vacation enjoyable and memorablethey are the best! Pool Heat - From October 1st - May 1st, the private pool/spa can be heated to mid 80's for an additional $325/week. Pool heat must be purchased for the entire stay.